Shimmermist Cave is a Falmer-infested cave system located northeast of Whiterun. The cave is used by the Falmer to breed chaurus. It has two internal zones: Shimmermist Cave and Shimmermist Grotto. Outside of the cave are several menacing Falmer totems that should be a sign to stay away. There is also a patch of bleeding crown fungus just to the right of the entrance. This cave system can be very difficult for low level players to clear. 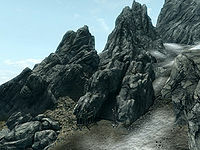 Shimmermist Cave is a cave system that is occupied by Falmer and chaurus. Entering the cave, it is strikingly unique with a plethora of bioluminescent flora and natural lighting. There are a lot of glowing mushrooms to be harvested throughout the cave system and chaurus eggs found throughout the second zone. The ambiance is beautiful with shimmering opalescent ceilings, green glows and free-flowing mist. Having a light source or Night Eye is recommended after this room as traps are hard to see and areas where the Falmer dwell are the darkest portions of the cave. The entrance leads into a passage that descends to the north before turning east and continuing to descend. On your right you will pass an imp stool fungus and ahead you will be able to see an earthen bridge crossing a pool of water fed by waterfalls pouring down the walls. There are ramps leading down into the water, but nothing of interest is found under the water. Above you on the north wall is a ledge that is used as a short-cut back to the exit. On the far side of the bridge is a frostbite spider or skeever. The path enters another narrow passage that continues to the east before turning south and opening out into a chamber with a ledge above you. There is a patch of Namira's Rot and white cap growing in the darkened passage and right by the exit into the next chamber is a tripwire that triggers a claw trap from above. There is a Falmer standing on the ledge keeping watch and on the right is a Falmer hive containing a concealed Falmer. To the left of the hive are the bodies of three dead bandits with several steel weapons on the ground among them. To the east is a Falmer tent with a closed gate blocking access to the interior. There is an unlocked Falmer chest to the left and inside the tent is a small fire and a patch of fly amanita fungus. The path continues past the tent and curves around to the west as it climbs a ramp up. There is another fly amanita and a bleeding crown fungi along this path. At the top there is an opening heading west that leads into another chamber, where the Falmer previously seen was standing on the edge of the ledge. Following the ledge west along the edge you come to a rock with two Falmer helmets, a Falmer Bow and quiver of arrows, a Falmer war axe and two loose chaurus eggs on top. Further to the rear against the west wall are four more patches of fly amanita fungus. To the south is another narrow passage that after a few turns and passing a patch of bleeding crown fungus opens out into yet another chamber with several rock pillars around the chamber and a leveled Falmer standing beside an unlocked Falmer chest with three white cap fungus beside them at the rear. To the right of the chest is a passage descending to the south. The passage leads to the entrance to Shimmermist Grotto. Shimmermist Grotto is the deepest portion of the cave system and by far the deadlier one. Falmer are found in larger numbers and, descending deeper, many chaurus egg sacs begin to appear. The passage leads out on to a ledge with two leveled Falmer opposite, next to a Falmer tent with gates on the entrance. In front of this is a dead goat and inside are several chaurus egg sacs and an unlocked Falmer chest. There is an earthen ramp leading down to the southwest. At the bottom a narrow passage heads west and leads to a chamber guarded by a chaurus. There is a skeleton in the middle of the floor. The exit is to the south and after a short passage it turns and opens into another chamber with two leveled chaurus in a feeding pit below. There is a ramp down on your right and a bridge that crosses the pit ahead. In the bottom of the pit there are three more skeletons. Another ramp leads back up on the far side, east of the bridge. To the west is an unlocked Falmer chest, to the right of a narrow passage. This continues to the west before turning south and entering a wider passage guarded by a leveled Falmer. There are a couple more fly amanita and white cap fungi growing in the passage—(see bugs). At the end the architecture changes to that found in Dwemer ruins and there is a pair of metal doors at the end. Beyond the doors is a room containing a leveled Falmer and a Dwarven centurion standing in a docking station. Both enemies are formidable foes and separating them is key—(see notes for tactics that may help to defeat them). Low level players will likely die in one or two hits from either one, even from being near the Dwarven centurion as its vents can be fatal. Dwarven centurions have difficulty maneuvering corners and can't fit into small spaces which can be taken advantage of to kill it with ranged attacks. In front of this is a stone table with two loose chaurus eggs, three Dwemer cogs, a Falmer sword, a Falmer War Axe, and various pieces of Dwemer metal. To the right of the docking station is an unlocked Falmer chest and beside this is a Falmer tent. To the east under a ledge is a partially buried dresser containing various Dwemer metal items. In the eastern corner is a ramp leading up to the ledge and the passage that leads back to the first area. The passage leads you back to the chamber containing the pool, on the north side on a ledge above the water. From here retrace your steps to the exit. If the centurion is lured via ranged attacks through the preceding hallway, it will in turn be stuck as the corridor is too short for its tall frame. This affords the possibility for ranged attackers to take advantage of the situation, but they must still beware of steam venting. Another way of effortlessly finishing the centurion is to hide inside the small hut in the room where the centurion is initially located. It cannot enter through the small entrance and will allow itself to get assailed by a barrage of attacks from inside without retaliations. Two quicksilver ore veins are located outside, west-southwest of the cave entrance. The first is in front of a large rock, and the second is directly south of it. It is possible to bypass the initial Falmer cave area and go straight to the grotto. In the first room with the bridge and two waterfalls, go across the bridge then immediately bear left and back, then jump up the rocks (a bit tricky) to the tunnel that leads to the grotto. You will come out on a stone shelf right across from the Falmer, who will be able access your position, but the centurion will not (if you back up a bit). It is also possible to reach this ledge by climbing the rock in the center of the bridge and using the Whirlwind Sprint dragon shout to reach the entrance. The fungi in the last passages and ruins don't seem to respawn no matter how long you leave it. ? This page was last modified on 15 November 2018, at 04:11.